all around you. 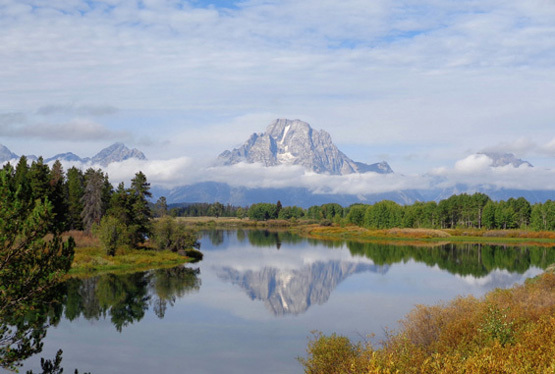 Whatever you're looking for you will find it here in the White Mountains." I am thrilled to be back in the White Mountains! 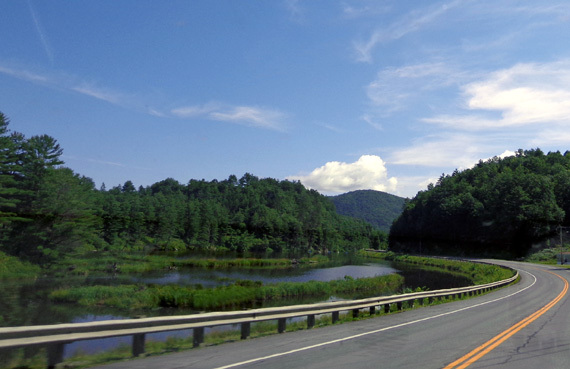 I loved this area when we were doing the Appalachian Trail Adventure in 2005 but didn't have the opportunity then to see other trails in this large mountain range or the attractions -- other than the summit of Mt. Washington -- that draw visitors from all over the world. Mt. 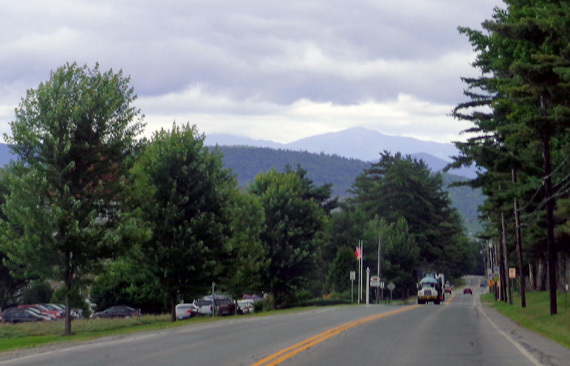 Washington is in the distance in this photo from Bethlehem, NH; you can hike or drive to the smmit. 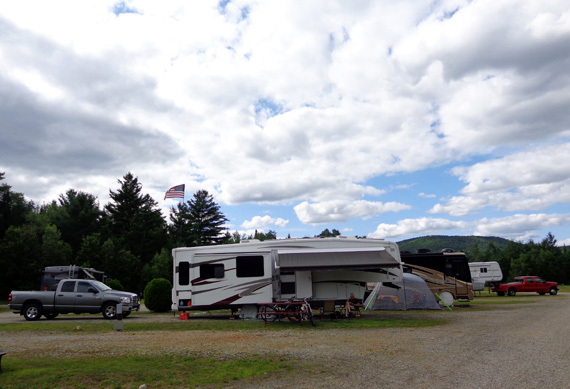 Our original reservation was for one week at the Twin Mountain RV Park since the owners offer a reasonable weekly rate. I'm writing this entry later (much later) so I can reveal that we liked it here so much, and had so many activities planned, that we stayed for two weeks. That also gave us a little more time to plan for the month we spent in the Canadian Maritimes, our next destination. Most of the photos in this entry are from this date but a few are from later during our stay. 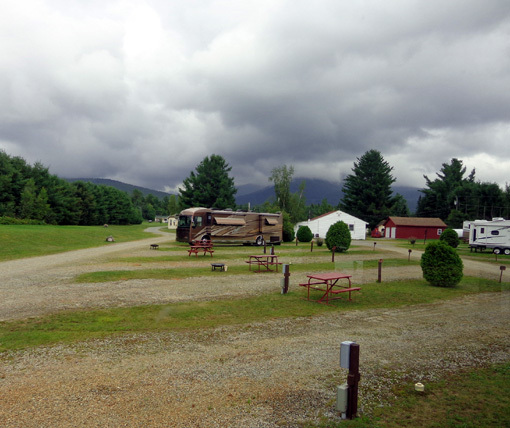 It was a short 84-mile drive from the Pine Valley KOA in Quechee, VT to the equally-small town of Twin Mountain, NH. 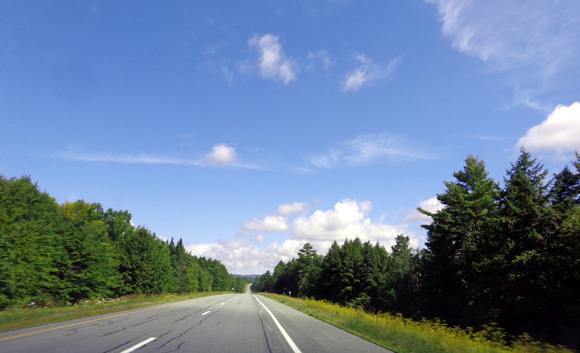 We drove north on I-91 in VT along the Connecticut River to exit 17, where we turned east on US 302 into NH. 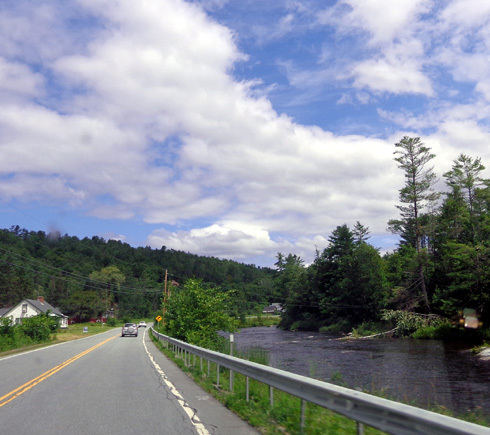 This is a very scenic route through forests and small towns, with views of the White Mountains to the east and south of us. 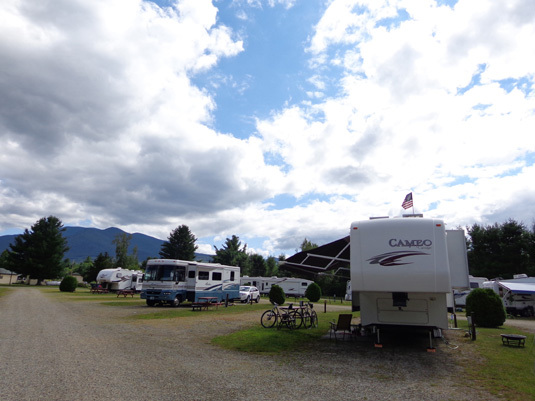 We stopped once along the way for groceries and arrived at the campground in Twin Mountain at lunchtime. North and Middle Sugarloaf mountains are to the left, Twin Mountain to the right. 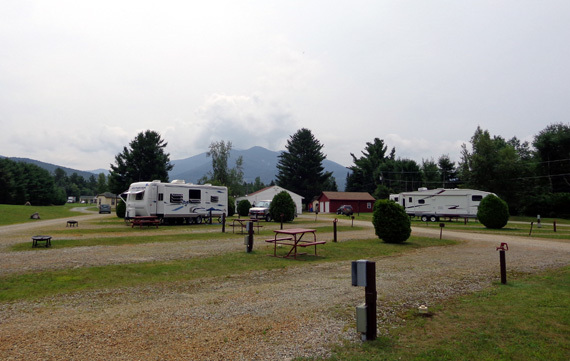 The campground is also convenient to all the trails and attractions in the Whites. We really like this place. We checked in quickly and met the campground host and one of the owners, who have been very gracious and informative since we've been here. That's our Carriage Cameo, looking south to Twin Mountain. All the sites have 30-amp electricity, water, sewer, and a good cable connection with lots of clear stations. Our Verizon phone and MiFi work great. 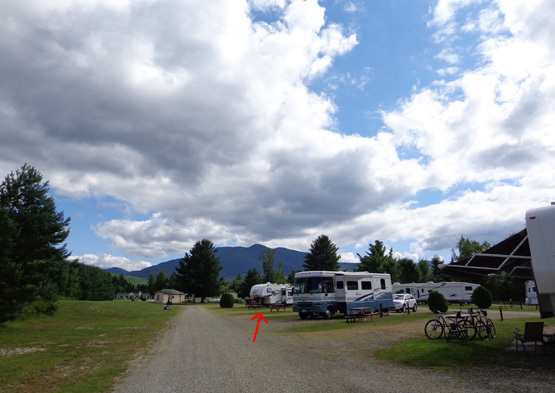 If no one is in the site next to our doorside we can get decent WiFi from the office (and nice views of Twin Mountain's two peaks). Otherwise, we have to use our personal MiFi. 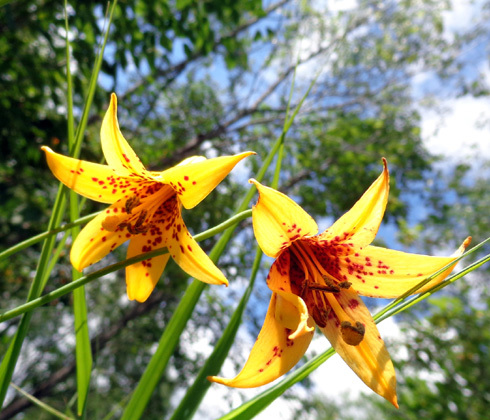 The daily rate is $40, the weekly rate is $240, and there is a seasonal rate of $1800 + electricity for up to six months. We were able to get a 10% discount with our Good Sam card, making our weekly rate $216 for an average of $32.29/day. That's higher than we usually pay at a military campground but it's a good rate for a private campground. 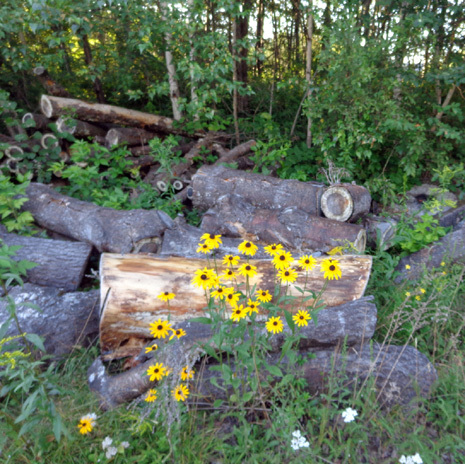 We paid 'way more than that at the last place, a KOA. 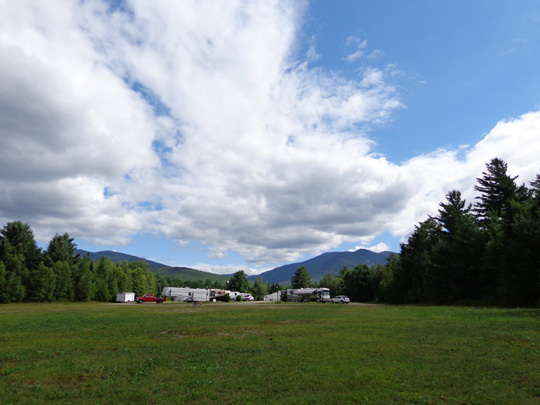 Guests in the RV park have access to an outdoor swimming pool, a small laundry room, a store/office/game room, and a large grassy field behind the campground where we can play ball with Casey. 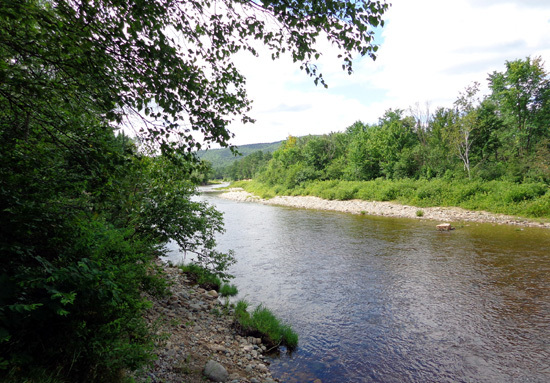 There is a steep path down to the Ammonoosuc River beyond the field but no access for the dogs to get into the water; the bank is too steep. I took the dogs down there almost every day we were here. We found lots of other streams in the Whites where we could let them swim. 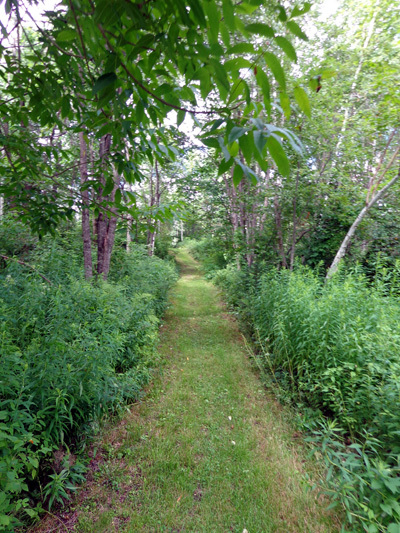 The ripe raspberries and pretty flowers along the trail made the steep ascent back up to the campground more enjoyable! 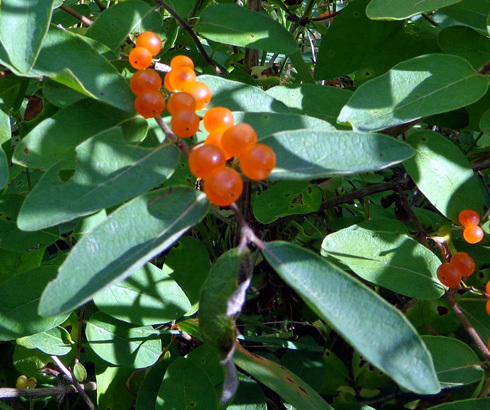 Unusual orange berries; didn't try to eat those! Another couple near us has a new Lifestyle 5th-wheel. It was interesting to compare our rigs. Many of the Carriage employees went to work at the company that produces Lifestyle coaches (Evergreen) when Carriage went bust in 2012. 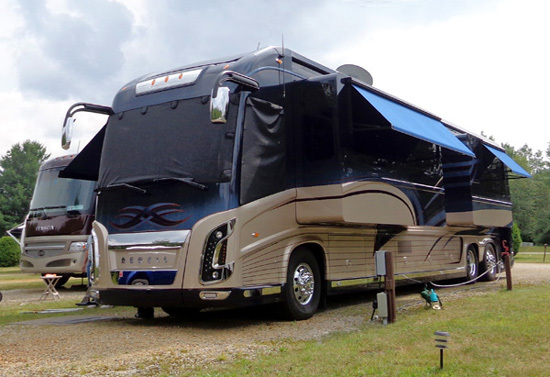 One day we were more than surprised to come home and find a sleek, brand new tan and navy-colored 45-foot Class A rig with a NY dealer tag parked next to us, blocking both our view and our WiFi signal. Without even knowing what it was, we knew it was expensive. We just didn't know how expensive until later that evening. When I got online with our MiFi card I noticed that the personal WiFi signal from next door was "Newell" and a four-digit number. I thought perhaps it was the peoples' name and house street number until we realized Newell is a high-end motorhome company. For the heck of it we googled "Newell" and the number, which I won't reveal. Turns out, Newell numbers each rig they produce. There are retail prices listed for the numbers before and after this rig, plus others, that are in the range of $1.73 million. Unbelievable! Yes, it looks great, with nice chrome and paint features, rounded slide edges (good idea), and cool colors. It's undoubtedly elegant inside, too. But one-and-three-quarters million dollars??? C'mon. 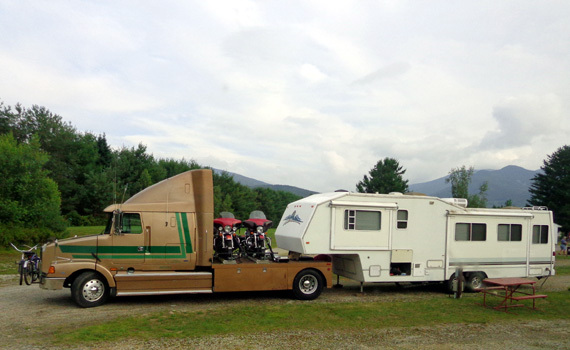 The sales tax in NY alone cost more than our high-end 5th-wheel cost new. Can't imagine what that high-tax state charges for registration fees, licensing, etc. I'm surprised they didn't form a Montana LLC to avoid the tax on it. As noted in one of my entries re: selling our house, it's amazing how much you can find out about someone on the internet. The owners are on the Newell online forum so we know their names, when and where they bought the rig (took possession just a few days ago), the concerns they have about it, and other personal information they've shared online. The main concern I'd have about it is fearing some idiot would run into it while we're driving down the road! No, we're not envious. We're perfectly happy with our own rig. Folks can spend their money any way they want. If we could afford one of those we wouldn't buy one. It seems ridiculous to us to spend so much on a depreciating item like a motorhome, even if they plan to live in it full-time. Big 'ole diesel semi with two motorcycles in the bed, hauling a pretty old 5th-wheel, and two bicycles on the front bumper -- they really need a long site like the ones in this campground. That reminds us of a combo we saw several years ago at the USAF Academy in Colorado Springs, except it had a teensy car sideways behind the truck cab and the 5th-wheel was a new, large, high-end model. It's been interesting here! This is just an example of the many ways people travel in RVs. Next entry: hiking to the summit of Mt. Washington -- nine years older this time -- can I do it? ?